Coach Kurt Taylor wins national award; Victor Torres selected in Shrine Game next summer. It has been a big couple weeks for the Madras football program. Not only did the program have five athletes earn all state honor, but also had head coach Kurt Taylor was one of only 32 coaches in the nation selected to be the United States Marine Corps Semper Fidelis Coach at the Portland Nike Clinic, Feb. 1 as well as senior Victor Torres earning a trip to the Shrine game in Baker City. Senior transfer Victor Torres earned honorable mention all-state running back for the Buffalos. He finished the season with 701 yards on 88 carries, averaging 7.97 yards per carry and 87.63 yards per game. "It really shows how good of a player he is," Taylor said. "He is really great and he is playing at the next level. It is a great honor to have a player in the Shrine game, but that was all him. We did not do anything really, but hand him the ball." "He is becoming such a good kid and he deserves to be there," he said "We nominate players and it gets sent to a committee and they make decisions based on how they are in the classroom, in the community, other sports and skills on the field. He met all of those. It is really neat for me because I am have never been to this smaller Shine game." 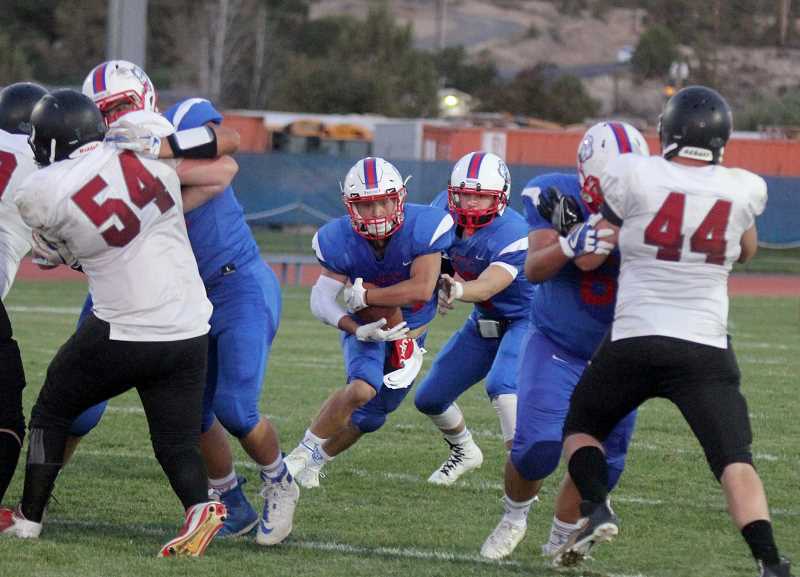 1A through 4A football players are selected to play in the East-West Shrine Game in Baker City. The last Madras football player to participate in the Shine game was class of 2013 wide receiver Devin Ceciliani. The program had one of the longest losing streaks in 4A history, but really turned things around in the 2018 season, making the 3A state playoffs with a 6-3 regular season record. Kobey Jorgensen (senior) earned honorable mention H-back. A type of fullback and tight end position mixed together. Jorgensen caught seven passes for two touchdowns, averaging 12.57 yards per catch and 12 yards a game. Junior Kody Zemke had a breakout year, ending the season with 86 tackles, 16 for a loss, four sacks, four forced fumbles, one fumble recovery and one interception. Zemke earned honorable mention linebacker for Madras. Kaegan Prevett earned honorable mention for the White Buffalos. Prevett was 5-for-5 on field goal attempts, 26-for-32 on extra point attempts, totalling 42 points for Madras. A high point for Prevett was nailing a 40-yard field goal. All-around senior athlete Byron Patt earned honorable mention for both wide receiver and punter. As receiver, Patt finished the year with 453 yards on two catches, with five touchdowns. He averaged 30.20 yards per catch and 50.33 per game. Along with his strong football season, Patt also played soccer for Madras as well as football and punted for the football program. Patt punted the ball 1,006 yards on 28 attempts, averaging just under 36 yards per punt. All five of these athletes earned first-team all-league during the 2018 season. The Buffalos will have two first team all-league players return next year in quarterback Robert Pacheco and Zemke at linebacker. 2017 first-team all-league (Tri-Valley) and 2018 second team all-league running back Treyvon Easterling will be returning for his senior year and Jeremiah Smith will return for his junior year after earning honorable mention linebacker as a sophomore in 2018. Only 32 coaches in the nation were selected to be the United States Marine Corps Semper Fidelis Coach and the Portland Nike Clinic gave it to Madras head coach Kurt Taylor. 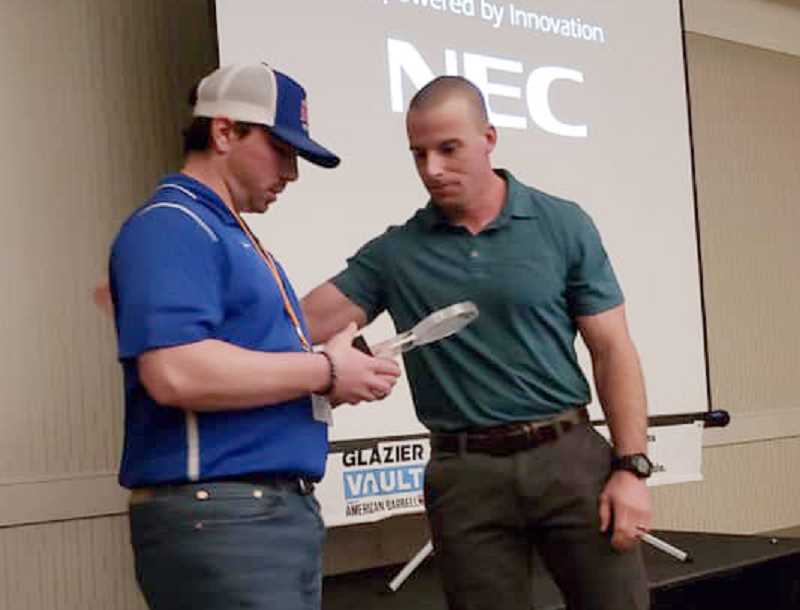 The award is given by the U.S. Marines Corps and Glazier Football Clinic to honor high school football coaches who display faithfulness to the mission of their team and exemplify the Marine standard of excellence in developing leaders. It recognizes a high school football coach who lives out the Marine Corps motto (Semper Fidelis) and who models Marine Corps leadership values of honor, courage, and commitment. "I really did not know it was even coming really," Taylor said. "Glazier Clinics called me and told me I was given this award. "It was a big surprise and a real testament to what we are doing in this program," he said. "I am at the head of it, but it is really a testament to the staff living the core values, asking the players to act that way and making corrections if they are not. It has really started to be noticed and now apparently around the nation."